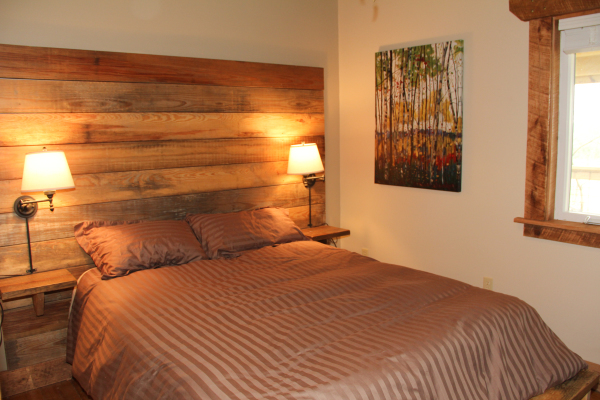 The Black Walnut Suite is the largest bedroom in the cabin, located on the upper level of the cabin. With a rustic king-size bed, spacious walk-in closet, and adjoining bathroom, one can relax and enjoy the tranquility of nature in comfort. The most striking feature of the suite is the view. The nine foot expanse of windows allows one to look out into the surrounding black walnut timber and the Brush Creek wetland. The Black Walnut Suite Bath features a marbletop, double sink and a 2 person Jacuzzi tub. 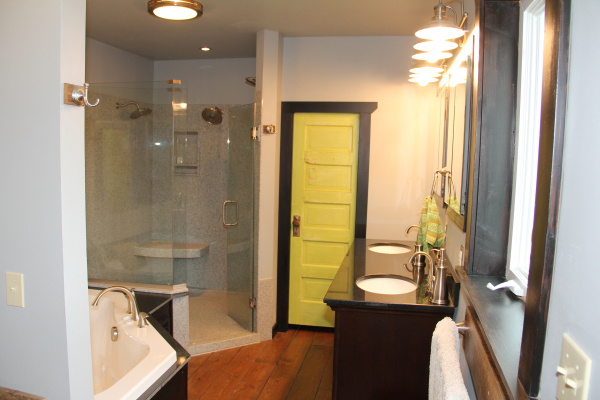 The 5x5 foot walk-in shower has a seat and double shower-heads. 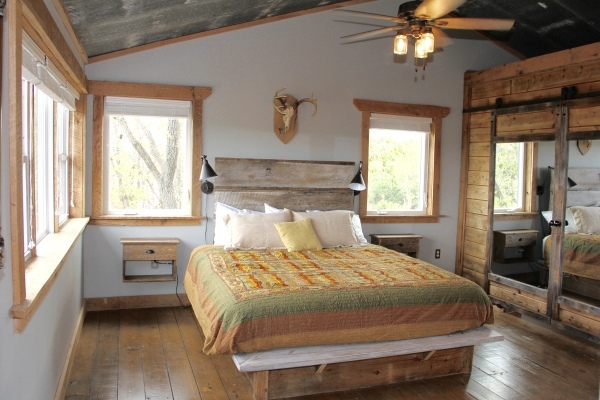 The Birch Room is a cozy hideaway, situated just off the main living area. This shady retreat offers a sunrise view and a queen size bed. The full bathroom is just across the hall. 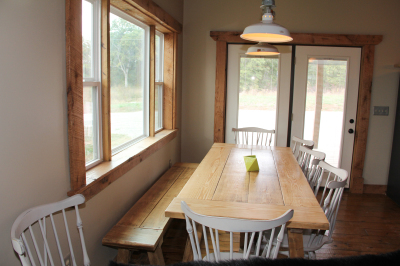 The Roost is located on the upper level of the cabin. 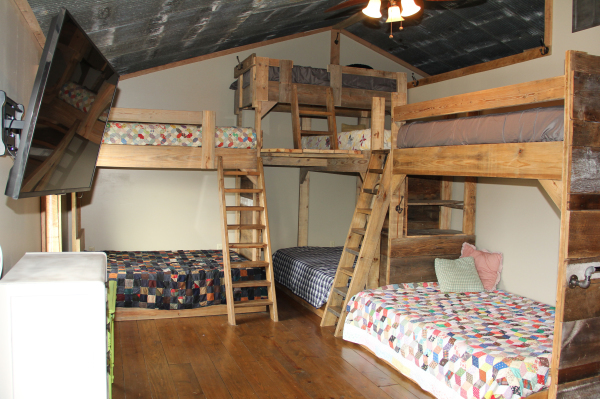 With 3 full beds topped by 4 twin bunks, it can easily accommodate up to 10 guests. 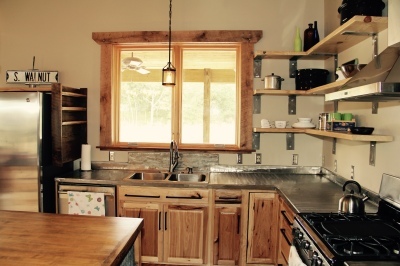 The fully equipped kitchen features a gas stove, dishwasher, microwave and refrigerator. 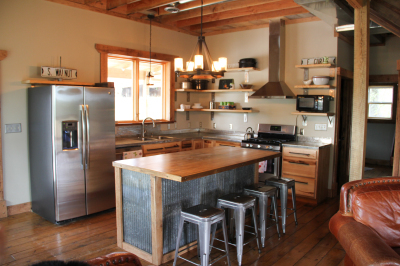 The kitchen genuinely shines with its custom-welded stainless steel countertops. 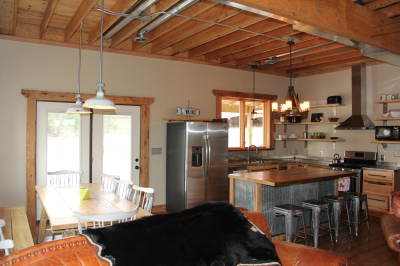 Guests can enjoy an intimate meal around the kitchen island, or a formal dinner for eight at the farmhouse-style dining table. The front and back porches provide ample space for outdoor dining.